FIGHTING AREAS: Each area (ring) must be composed of a minimum of 64 square meters and maximum 100 square meters. This area will be divided into two areas: the inner area composed of at least 18 tatames (mats) of a green color. For example, and the outer area, the security area composed of 14 yellow tatames or any other color except green . For each area of competition there are two scoreboards, indicating the score horizontally, situated on the outside of the table, easily viewed by the referee, commission and the spectators. During the match the central referee is to always be directing the competitor to the center of the ring. In the event that the competitors move out of bounds during the match, the referee will call "PAROU"and at the same time the referee will do the gesture according to the command, and the competitors must hold their position without movement. The same occurrence will happen when 2/3 of the competitor’s body is outside the boundary. The referee may be assisted by the timekeeper in moving the athletes back to the center of the ring. In case the referee and the timekeeper are unable to move the athletes back to the center of the ring, the athletes will be asked to walk back to the center and continue from the same position. After the table gives the signal whistle, that the match is over, the referee can give an advantage point to the combatant for attempting a submission or for attempting to establish a dominant position without maintaining for the required time, except for take-downs because athletes don't need to establish a dominant position to award points. OBS: According to Confederation Of Brazilian Jiu-Jitsu regulations there will be 3 referees per ring. When a match is in action, the criteria’s are as.following. means all 3 referees can call points and advantages as well as punishments. awards 3 points for guard pass, one of the side referees awards an advantage while the other side referee awards no points. The call we be advantage, because that is the decision between the two extremes. The throwing techniques of the competitors, by order of the central referee, will be noted on the scoreboard or on the official score papers by the scorekeeper with only the corresponding points. In case of a draw in points and advantages the scorekeeper will raise the two flags together simultaneously. Then, the central referee will analyze who was the fighter with the better performance-in accordance with the rules which award the victory to the fighter determined to be most aggressive in pursuing the victory during the fight. There will be no draws in any case. The central referee will decide who is the winner and his decision is absolute. cases the fight continues a draw the referee will judge how is the winner. The gi checker verifies before the fight that the competitors’ nails are trimmed, the is correctly fitted by the official CBJJ measuring tool and assures that gi the color and the state of the belt is appropriate for the competitor. colored gi or indicating belt. -Penalties: The referee will turn his hands one over the other with both fists closed after signaling the color of the penalized competitor and give an advantage to the other fighter. -To take off a awarded point:The referee lifts the arm that he gave the point with and waves his hand. e) the referee may end the fight giving victory to the one that applied the lock if he sees a lock being properly applied and is certain that the Athlete is exposed to serious physical damage. g) When an athlete is under a submission position and he screams or say "Aï" , will be the same as if he taps. The referee may end the fight when one of the athletes is injured or the doctor’s examination proves he is incapable to continue. If this occurs, the victory will be given to the opponent as long as the injury was not caused intentionally by conduct worthy of disqualification. h) When the athlete request that are eagerning caimbras, will be the same as if he taps. 1)SERIOUS FOULS ARE THOSE THAT LEAD TO IMMEDIATE DISQUALIFICATION BY THE REFEREE. D-) The fighter must wear shorts under the pants, keeping in mind the risk that the suit might get torn or unsowed, If this occurs, the athlete will be given a set time determined by the referee to find another pair of pants to wear. If the athlete can not change within the set time, he will be immediately disqualified. A) The athlete will only be allowed to kneel after having taken hold of his opponents kimono. B) When either of the athletes run to one of the extremities of the ring to avoid combat, or while ground fighting flee by crawling or rolling out of the ring or by standing up avoiding engaging or purposely stepping out of the ring to gain time. E) When the athlete stalls the fight, holding his adversary and, not seeking to engage or gain submissions when in the guard, on top, or on the bottom. F) NOTE: A penalty with immediate loss of 2 points occurs when an athlete runs from the ring in order to avoid a sweep that the referee considers would be completed, or when the athlete flees the ring in order to avoid a lock that has not yet been completed and not engaging in the article "E" for disqualification. A) TAKE DOWNS: Any kind of knocking down the opponent or being taken down on his back side, 2 points. If the athlete is thrown to the ground and does not land on his back, the thrower must pin him to the ground in the same position for at least 3 seconds to gain the points of the take down. B) PASSING THE GUARD: Is when the athlete that is above his adversary or in between his legs, moves to his opponent’s side, establishing a perpendicular or longitudinal position over his adversary’s trunk, dominating him and leaving him no space to move or to escape the position—if even is on his side or back. 3 points NOTE: if the athlete that is underneath avoids the move by getting to his knees or standing up, the initiative will not be awarded 3 points but will be awarded an advantage. C) KNEE ON THE BELLY: When the athlete on top puts his knee on his adversary’s stomach, holding his collar or sleeve and belt with his other leg towards his adversary’s head: 2 POINTS. D) THE MOUNT: is when the athlete sits on his opponent’s torso; the opponent can be lying on his stomach, side or back. The one mounted can be on top of one of his opponent’s arms, but never on both. It will also be considered a mount if he has one knee and one foot on the ground, 4 POINTS. E) THE BACK GRAB: Is when the athlete grabs his adversary’s back, taking hold of his neck and wrapping his legs around his opponent’s waist, with his heels leaning on the inner side of his opponent’s thighs, not allowing him to leave the position.4 POINTS. NOTE: the points will not be awarded if both heels are not properly positioned on the inner part of the adversary’s thighs.Also be considered back if the athlete has the leg over one arm of the will opponent but never over grab both arms, in this case no points will be awarded. F) THE SWEEP: is when the athlete that is underneath has his opponent in his guard(in between his legs ) or the half guard (having one of his adversary’s legs between his) and is able to get on top of his adversary by inverting his position. 2 POINTS. • In all categories the central referee has the authority to stop a match when either of the competitors is in danger of serious bodily harm as a result of a submission and award the victory to competitor applying the submission. • In children's divisions between 4-15years, when a competitor is executing a triangle and the opponent stands up it is the referees obligation to stand in a position to protect both athletes, specifically to reduce the risk of cervical damage. C. People with long hair must keep their hair from interfering with there opponent or them self during the match. C. The jacket is to be of sufficient length down to the thighs, sleeves must reach the wrist with arms extended in front of the body. 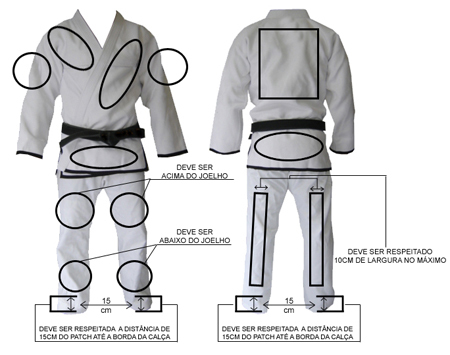 The sleeve should follow the official measures according to CBJJ, and IBJJF.From the shoulder to the wrist. unofficial people giving instructions from inside the dedicated area of competition will warrant disqualification of the competitor. a) If points or advantages are confirmed they will determine the winner. b) If no points or advantages exist the result will be a draw. 7.In case the athlete is attempting to pass the guard and attempts a footlock without success with the adversary sitting up, the competitor on top will receive2 points after he defends the attack and keeps the position for at least three seconds In addition if the competitor attempting the submission, puts the opponent in visible danger he will receive an advantage point. 8. In case that the athletes weigh with one kimono and change it for the fight they will disqualified, except in case that the referee tell him or her to change the kimono, but it must be measure again when the referee looks is necessary. 9. Now a days we have the local that is possible to use the patches and others corrects positions, they are. 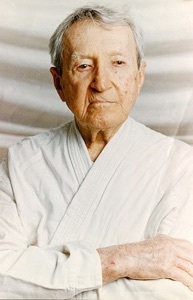 We would like to thank all the people that gave a hand with this manual, which is nothing more than a modern adaptation of the one created 20 years ago by the teachers and Great Masters Carlos Gracie and Helio Gracie when they founded the Jiu- Jitsu federation of the state of Guanabara. Many contributed with this manual, whom we can name; such as: Dr.Ecio Leal and Master Pedro Hemeterio. We have as contributors to this new version Master Alvaro Barreto, Master Mansor, Master Carlos Robson Gracie, Master Osvaldo Alves, Master Flavio Behering, Prof. Jose Herique Leao Teixeira, Assed Naked Hadad, Master Royler Gracie, Fernando Guimaraes, Mr. President of the LERJJI Silvio Pereira, Prof. Carlos Gracie Jr. and Professor Alvaro Mansor Guarconi.